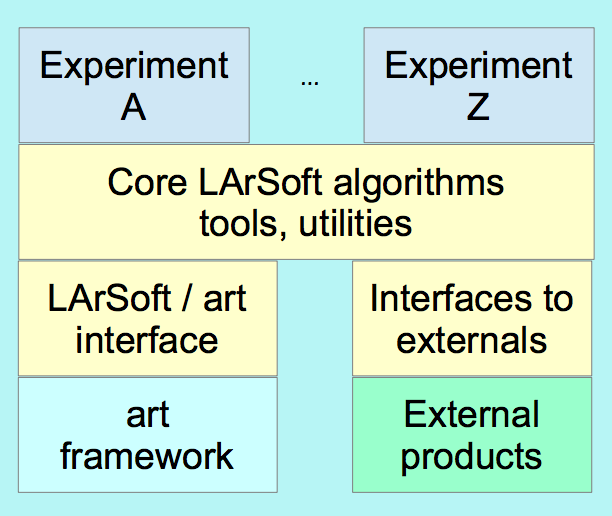 The LArSoft body of code has two components, experiment-specific code shown at the top in the diagram and experiment-agnostic data structures, algorithms, interfaces, etc. shown in yellow. The experiment-specific components live in repositories managed by the experiments. The core LArSoft code lives in a set of git repositories maintained by the LArSoft core team. These git repositories are hosted at Fermilab in Redmine although an experiment-specific component could be hosted elsewhere. The core LArSoft code is organized into git repositories as follows. 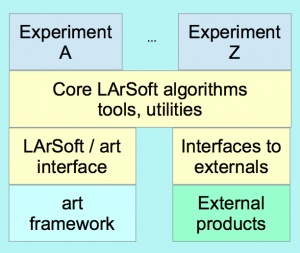 larcorealg core algorithms shared between larsoft and art-independent frameworks such as gallery, larlite, etc. lardataalg algorithms shared between larsoft and art-independent frameworks such as gallery, larlite, etc. larexamples examples of writing algorithms, data products, etc. The build procedure creates and installs a UPS product from each repository. (A UPS product is a software package set up and distributed via UPS, Unix Product Support.) Each UPS product is entirely self-contained, aside from dependencies. a directory for configuration files, dependency lists, etc.